How can power overcome its oppression? This article is part of our Black History Month coverage. These were only a few of liberal political commentator Angela Rye’s ringing words to the audience at the 33rd Annual Martin Luther King Jr. Celebration. 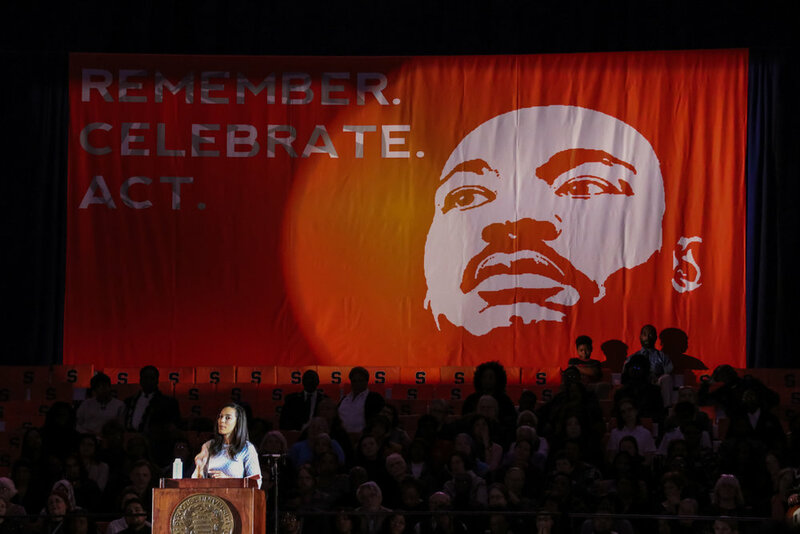 The commemoration at Syracuse University is observed as one of the biggest celebration of its type in the United States. 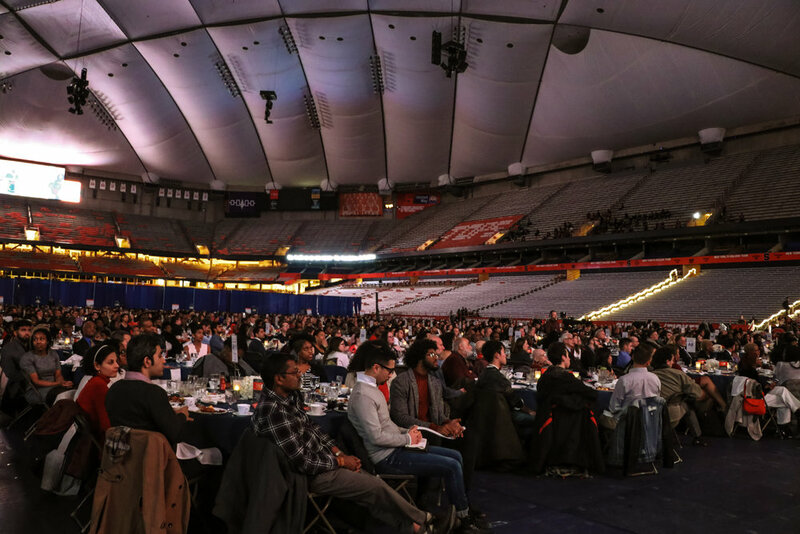 Over a hundred round tables bedecked in white cloth and flowers welcomed the attendees into the Carrier Dome, where a huge orange artwork of Dr. King hung behind the podium, emblazoned with the words “Remember. Celebrate. Act.” The words and recordings of Dr. King’s speeches played on the speakers. Get a quick, under-a-minute glimpse at the 33rd Martin Luther King dinner. Video by Saniya More. The evening paid homage to Dr. King’s pioneering work with student performances like the SU Black Reign Step Team and the Young and Talented Hip Hop Performing Arts Company. The two groups were inspired by his “I’ve Been to the Mountaintop” speech and his practice of non-violent protest. Student performances also saw musical selections by the Black Celestial Choral Ensemble, the Black Legacy A Cappella Group and original individual selections as well. Rye’s words grew more piercing and emotional as she addressed the challenges in achieving power, justice and fairness among the black community and communities of color. Her words outlined a historical journey of injustice, from the transatlantic slave trade to the modern prison industrial complex. Dr. King’s vision was still far from fulfilled, she said. “We have so much further to go, but we have come very far, even though some of us may argue that might have backslid just a little bit, thank you to your President,” she said to cheers and chuckles from the audience. Rye defined power as the ability to achieve purpose. In demanding power for communities that are still reaching for it, she called for greater interdependence and action in the way forward to honor Dr. King’s legacy. Where we’re going from here requires going, she said, it requires movement. In a media room conference prior to the event, Rye also addressed college activism, protest, and initiatives like the Globalists. We asked Rye about the way forward to creating effective dialogue and making sure one’s voice is heard. 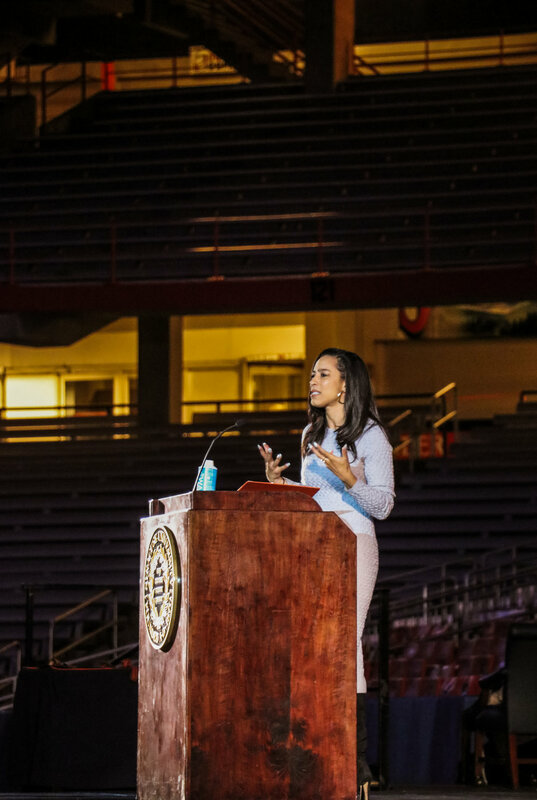 Keynote speaker Angela Rye talks to Globalists about why it is important, now more than ever, for people to find common ground and connect. Video by Saniya More. Divya Murthy, a junior at Newhouse, is a tiny bespectacled blot on the orange landscape of Syracuse University. She is under the impression that she’s the fourth PowerPuff Girl, but when she’s not using her creativity thus, she enjoys drinking filter coffee, reading Wodehouse novels and imagining life without the pumpkin spice latte. Saniya More, a junior at Newhouse, speaks five languages and squeals over every dog she meets. She enjoys capturing candid yet poised photos of everyone she meets. If she’s not juggling news wraps, internships and homework in organised chaos, she can be found cooking up a mean Thai dinner.